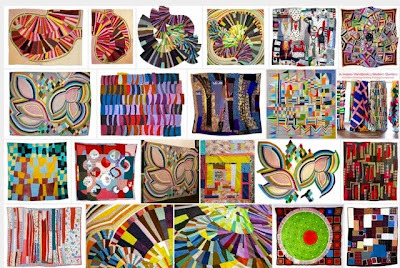 Ah....FEARLESSNESS in quilting gets my heart beating a little faster. You know the cliff diving, wind surfing, roller coaster riding type of fearlessness. All, of which I wouldn't attempt, in real life, even if my very existence depended on it. In other words, I sort of....okay, I really like to play it safe. I am basically a non-risk taker. Just ask my kids, they will verify this without blinking. There is always talk of my "Worry Line" showing. But when I quilt.......I get to ride the wave, fly through the air....well, you get the picture. When I registered for Quilt Con I got booted out of the system three times. By the time I got back in, most of the classes were full.....I managed to get into one workshop, but that was it. At first I was a little disappointed but I decided to check out the lectures. For me, this really turned out for the best. Luke Haynes...... just jumped right into the deep end of quilting....he didn't seem to know there were rules. I mean, why would you change a sewing machine needle unless it was actually broken!! Fearless!!! 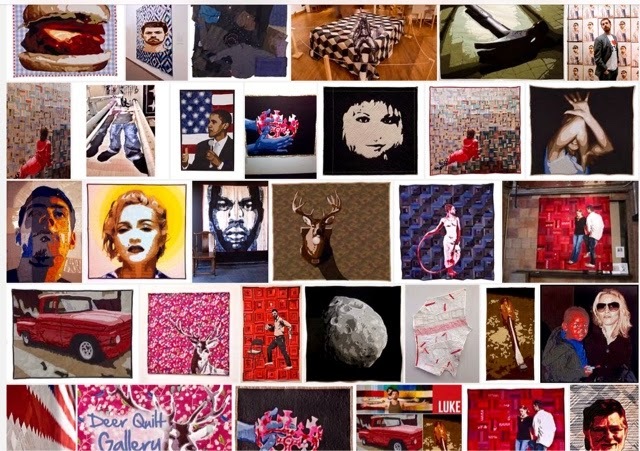 Victoria Findlay Wolfe....When something doesn't work, what do you do....cut it up!!!! Fearless!!! Sherri Lynn Wood.....Ruler free! Letting our work come from a deeper place! Fearless!!! Having fun....in Sherri Lynn's workshop...It was a struggle limiting myself to only a few colours for this particular score from the Improve Handbook for Modern Quilters. Never fear....if it doesn't work out I'll just cut it up!! Fearless....right?? Then there's Jacquie....always ready with a smile and a hug. Jacquie gave a fabulous lecture on The Art of Teaching. So completely authentic, when sharing her experiences as a teacher (the negative as well as the positive)! Fearless!!! Pardon the goofy expression on my face.....there seems to be a lot of that whenever the camera comes near me. 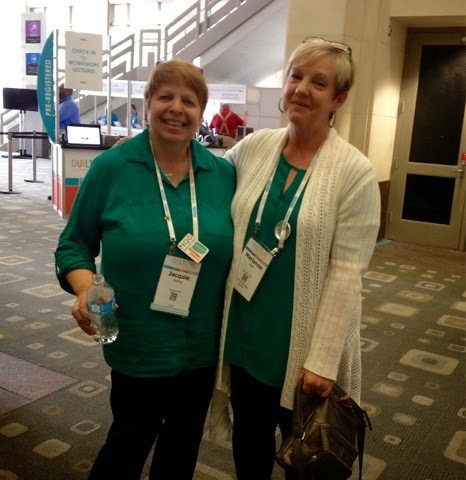 And yes, we planned our co-coordinating outfits. Kidding!! 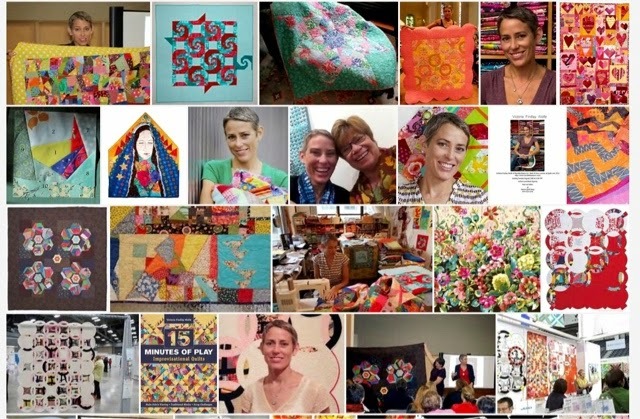 The word FEARLESS just resonated within me throughout all of Quilt Con. 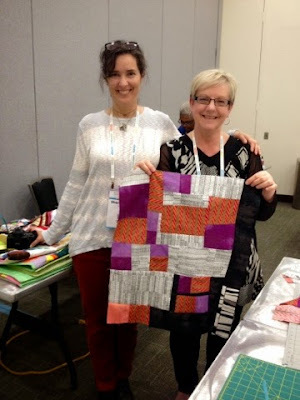 The Gee Bend Quilters shared from the heart. Again....the word fearless came to mind as they sang and shared. Then, there was the meeting of the other quilters....perhaps a little fearful. But no need, the friendliness was simply overwhelming. The exchange of cards and buttons......wonderful!! 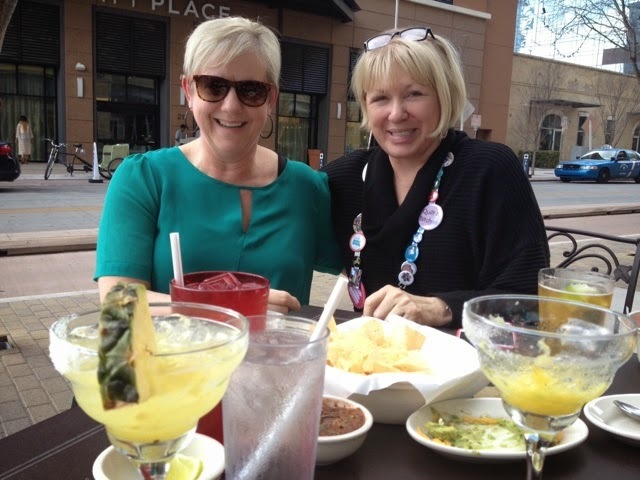 Meeting up with Kathleen....catching up, exchanging ideas, stories and of course good food!! Lots of laughter and hugs! 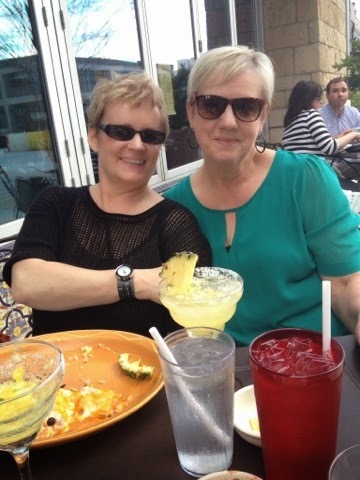 Good times with Jo-Anne! Meeting new friends and catching up with old ones....it was a total delight and I haven't even talked about the quilts. Maybe next post. The show was a delightful visual overload! Sounds so so wonderful...Fearless...I could use some of that now in my fear filled life!! Looks like so much fun! Thanks for sharing! I hope to go someday. I love hearing about your experience. Fearless is an interesting way to look at things and definitely not something I'm comfortable. 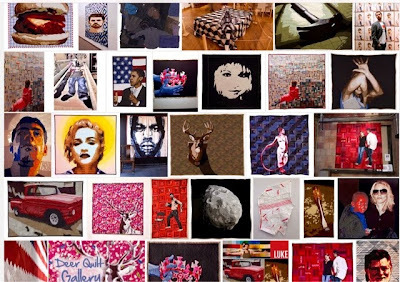 I do think your work is fearless in how you sew and cut and sew. It was so lovely to meet you in person. Wish we could have talked more though. Now I wish I had taken the lectures you did as well as the ones I took. Next time right? 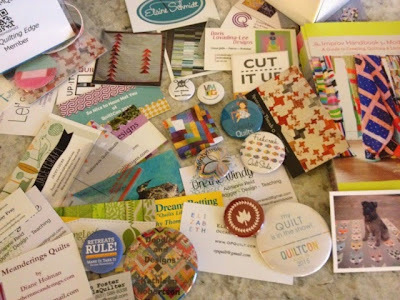 QuiltCon registration was the same for me and turned out to be a just what I needed. Lots of inspiring lectures and got in on one class "Off The Grid". Which was fantastic! 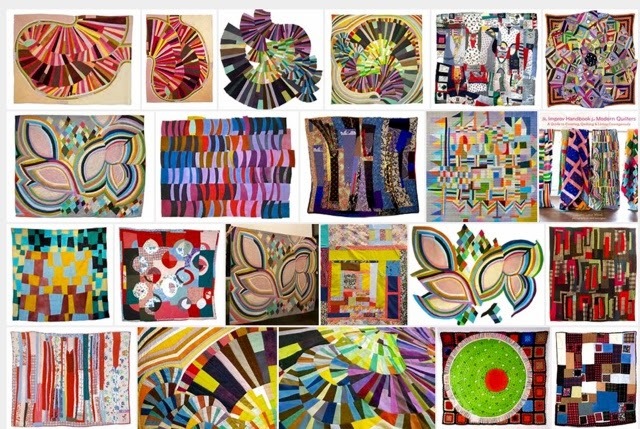 I have admired your quilts for years but truly was mesmerized by seeing it in person. You are GIFTED!!!!! Sorry I missed you at QuiltCon. It was so amazing, wasn't it? I wish I had met more people - memo to self - no more volunteering, just go and have fun! Hey Lady. I'm going to be in Victoria next week and have some free time on Tuesday after my lecture. I'm not sure of your exact location? I am looking forward to seeing the quilts you will make after your quilt con experience. a little late to this post but it looks like you had fun! 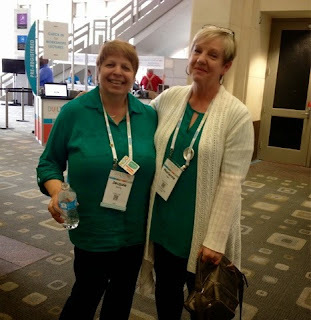 Marianne, it was great seeing you at QuiltCon, and attending many of the same lectures. I agree with your assessment of the lectures by Luke Haynes and Victoris Findlay Wolfe - both very insprirational. I'm happy to see you have a VMQG button in your collection.